I first met Israel Blume, CEO of Coincident Technology, through our mutual friend Dan Meinwald, of E.A.R.-USA, during the Consumer Electronics Show of 2002. Over the years, Israel and I have spent a good chunk of time talking about speaker technology, and crossover and cabinet design. Being a past tinkerer with speaker enclosures, it was nice to get the inside scoop from one of the most respected speaker designers of our industry. I place Israel right up there with Michael Kelly of Aerial Acoustics, Dave Wilson of Wilson Audio, and Jim Thiel (RIP) of Thiel Loudspeaker Design as one of the very best loudspeaker designers this hobby has to offer. While each speaker designer from this distinguished list has their unique take on how a speaker should be designed, it is Israel's highly efficient, easy to drive, and tube friendly designs that captured this reviewer's interest. 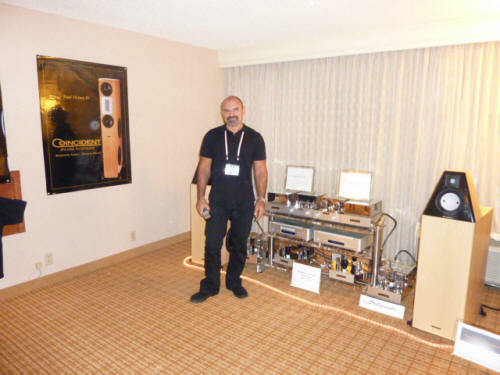 The challenge of hi-end audio shows. I caught up with Israel at last year's 2010 Rocky Mountain Audio Fest (RMAF) in Denver, Colorado. Let's face the facts; often at hi-fi shows demonstration rooms aren't all that great sounding as compared to a dealer designed sound room, or our beloved listening rooms at home. Often demonstration rooms are too small, don't have the right proportions, and are not well built. All of this translates to a poorly designed room for high end audio listening. I mean come on people; they are hotel rooms you know! Just to be clear and in order to avoid a multitude of e-mails, I am speaking in general terms regarding room size and room design. Over the course of the three day event RMAF I visited about 75 different rooms. Though there were many rooms that did make beautiful music, there were others that didn't impress me at all. As always, there are a few rooms where everything seems to click into place and sounds fantastic. One room that clearly stood out amongst the crowd was the room put on by none other than Israel Blume of Coincident Technology. At RMAF, Israel was demonstrating his top-of-the-line Coincident Technology Pure Reference Extreme (CPRE) loudspeakers along with the Coincident Statement Linestage, Phonostage, and M300 SET Frankenstein mono-blocks, all hooked up with Coincident Extreme cabling, and the main source being an Esoteric D-05 DAC, and Esoteric P-05 SACD/CD transport. This room sounded fantastic! What I was hearing from the Coincident Technology room wasn't music emerging from a pair of speakers, but rather the performers emerging from an acoustic space that completely involved and enveloped the listener. That room had the punch of live music, clearly replicating macro and micro dynamic energy with equal skill. Looking at the floor, I realized these speakers were achieving that kind of sound from a pair of flea sized, 8 watt per channel, mono-block amplifiers. Now I was even more impressed. I wanted to know more about these remarkable loudspeakers. During the show I made a point of visiting Coincident's room multiple times. Fact is, the Coincident room sounded so good, I used this room as my main reference point for all other rooms. If I'd had my way, I'd have ordered a pizza, brought in some beer, and done an all nighter. It's the motion of the ocean that really matters. Proper speaker matching when using a first order network at 6dB per octave design is essential in order to avoid lobbing effects at the crossover point. Israel solved this issue by choosing the best parts sourced from Accuton and Peerless, all of the drivers are matched within 1% each, and designed to Israel's proprietary specifications. Even the cabinets are designed to perfection using a multiple braced MDF structure, the walls of the cabinet are 1.2" thick, and the baffle for the subwoofers is an industry rarity 2" thick. These basically inert cabinets result in a non-invasive resonant frequency within the cabinet of around 350 Hz. To top things off, all cabinets are finished using the best furniture grade veneer available. The CPREs do not offer bi-wiring. Regarding bi-wiring, Israel doesn't believe in it. For more information regarding bi-wiring here is an excerpt from Israel's website on the topic. Bi-wiring is when a loudspeaker has separate connections to the bass and the treble/midrange. The idea is to use individual speaker cables to each section. Besides being profitable to cable manufacturers since the user is required to purchase double the amount of speaker wire, are there any sonic benefits to this arrangement? The answer is yes and no. Yes it is a benefit for loudspeakers that are not properly designed. In speakers where the crossover sections are interdependent and not adequately isolated from one another, bi-wiring will likely offer a sonic benefit. However, in speakers, (like all Coincident models), that have all the crossover sections, (high pass, low pass etc), completely separated and isolated from one another and are run to the binding posts, (as opposed to being interconnected between sections and wiring all the hot and grounds to the speaker's binding posts), bi-wiring affords NO sonic advantage and may actually involve a sonic degradation depending upon the speaker cable used. Coincident recommends bi-wiring only in those cases where a consumer has the intention of bi-amping his speakers. A bi-wiring option will be necessary if one is bi-amping a system, meaning separate amplifiers will be powering different drivers. Otherwise, bi-wiring is not only totally unnecessary and a waste of money, but a pain in the derriere. For those who have the some flexibility regarding speaker placement, Israel offers a matching stand (Retail $999) for the CPRE monitors. This gives the end-user the ability to place the monitors in one location for best imaging and sound staging, and place the subwoofer cabinets somewhere else in the room for best bass loading and impact. Pretty cool stuff in my opinion! Regarding the drivers and parts that populate the CPREs, I feel this needs to be addressed in greater detail. For the CPRE, Israel chose Accuton 1.2" ceramic tweeters that use an under-hung Neodymium magnet system featuring an aluminum voice coil filled with Ferrofluid. This combination promotes excellent heat transfer, higher power handling, wider bandwidth, along with lightning quick transient response time. Couple that with the tweeter being almost razor thin, at 8 0hms across its frequency band, and you have a designer's dream tweeter. Israel states it is next to impossible to blow the tweeters up, I believe him. 3000 Hz because he believes this is a critical point in the midrange. By crossing mid/woofers to the tweeter at 4000Hz this allows the midrange to emerge from the speakers with improved clarity. Most of the midrange is reproduced by the mid/woofer long before any music is sent to the tweeter. Another advantage of crossing over the tweeter at such a high frequency point is that it improves upper-end clarity and power handling. When it comes to handing over the low bass to the subs, Israel tuned and ported the monitor cabinet to naturally roll off the bass at 110dB, thus preventing the use of a large signal choking capacitor. Couple that with Israel using a minimalist crossover with only one capacitor (Mundorf Supreme Silver/Gold/ Oil) in the monitor, and one coil for the subwoofer, it is no wonder these speakers are one of the most transparent loudspeakers I have ever heard to date. Knowing how impressed I was with the CPREs at RMAF, I tried getting a pair for review. After discussing my current sound room, it was decided that the Coincident Pure Reference (CPR) would be the best speaker for this project. I was giddy with happiness that the CPRs were chosen—they truly seemed like the speaker for me. Comparing the CPREs to the CPRs, both units use the same drivers, wire, crossover points, and parts. Like the CPREs the CPRs utilize a well braced computer designed MDF cabinet with 1.2" side walls 2" walls for the baffles. With the kids in day care my wife and I spent the better part of the day un-boxing and setting up the speakers. What a sight to behold! These speakers are drop-dead gorgeous—even my aesthetics conscious wife liked the look of them. My review samples were veneered in a blond ash with the front baffle in flat black. Located at the top of the loudspeaker are the Accuton Ceramic tweeter and mid/bass driver. There are no speaker grills or covers for the front of the loudspeakers. You have to love the look of the white diaphragms of the Accuton tweeters and mid/bass drivers against the black backdrop of the front panel. Normally I like my speakers completely veneered on all sides. In this case it made sense to use the flat black finish on the front speaker baffle as it highlights the drivers. On the side of the CPRs are two Platinum Line Peerless 12' subwoofers with Nomex cones. Nomex is a synthetic material known to help prevent cone break up. The subwoofers are built to Israel's specifications just like the Accuton tweeters and mid/bass drivers. Finally the subwoofers are stacked on each other in a CAD staggered pattern that helps with the bass loading of the speaker. On the back is a single pair of gold-plated high quality binding posts. "We don't need no stinking bi-wiring here." Normally I bi-wire all of my loudspeakers faithfully, but with the CPRs sounding so good in a non bi-wire arrangement, maybe Israel is right by not offering it. For the purpose of this review the speakers were installed in my main living/dining combo room measuring 13' x 27' with a 22' cathedral ceiling that opens up to a large loft upstairs. By California standards, this is a very large room. I placed the speakers in the back part of the room where one wall is open to the family room, meaning the right speaker did not have the same bass reinforcement as the left speaker. Though one would think this arrangement would be a less than ideal with all of the uneven walls that open up into an upstairs loft, this room works really well as compared to my last sound room. Sound emanating from this room has weight, and it fills the home with music throughout. It is very lifelike due to the large soundstage presented in front of the listener. Inward or outward—that is the question? Regarding the placement of the CPRs, subwoofers firing inward or outward, I chose the outward position. Speakers were placed 37" from the side walls, and 44" from the rear wall. The speakers were 88" apart from center of left speaker's tweeter to center of right speaker's tweeter. The listening position was located at 92". Speakers were toed in with the center of each tweeter pointing toward the sweet spot position aimed at just outside the left and right shoulder of the listener. To place the subwoofer inward facing or outward facing, that is the question--isn't it? Using the inward facing configuration with my current room, bass was not as well defined. It sounded homogenized and sort of weak, translating to one-note type bass that killed the life of the performance. 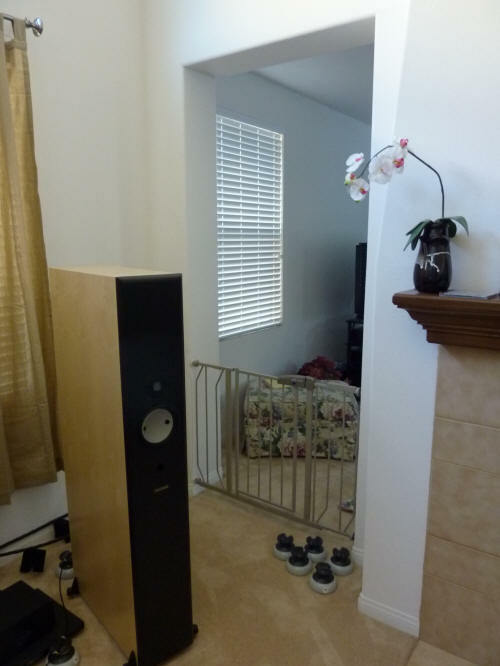 I am sure having my rather large room, and my rig placed in between the speakers didn't help much when the woofers were facing inward as opposed to outward. Perhaps in a smaller room where the rig is on the side wall as opposed to being in between the speakers, inward facing may work. Another factor worth mentioning, in my current room I am using minimal room treatments—no RPG Skyline Diffusers, Sonex panels, or Bass Busters. The room treatments are very simple, the cement foundation is carpeted wall to wall, and a single set of curtains cover the large double paned windows behind the speakers. My reference gear is as follows: An Audio Horizons 2.2RcvB line stage, a Cary Audio 303t SACD/CD player, a Marantz SA-7s1 SACD/CD player, an E.A.R.-Yoshino 890 KT-90 based tube amplifier, an Anthem Amp-1 SE+ EL-34 based tube amplifier as modified by Parts Connexion, and a Cary Audio Xciter—a 6L6 based 5-watt per channel integrated headphone amplifier. Cables are all Audience Au-24e including the power cords. The line conditioner is an Audience aR6-t (Teflon). The equipment rack is a Townshend Seismic Sink that supports the entire system on a bladder of air—very cool stuff. All in all a pretty sweet rig, it focuses on sound-staging, instrument layering, and PraT. In short, when all things come together my reference system truly boogies with the best of them. Like any other audiophile, I had to listen to the CPRs prior to full break-in, so I grabbed a couple of my favorite CDs and took a quick listen. I knew right away that my tried and true Aerial 7Bs were not in the same league as the CPRs, even with zero to no break in time. The Aerial 7Bs have been my reference speakers for over seven years, and the CPRs just smoked them—it wasn't even a contest. Everything I liked about the Aerials was clearly improved upon while listening to the CPRs, sound staging was deeper and wider, instrument imaging become sharper and more in focus with the speed, and impact of the CPRs being so fast and realistic it made the 7bs seem like a slug in comparison. Other areas of improvement as compared to my 7Bs are: upper end detail and extension didn't sound bright or overdone, bass production was deeper and snappier, with true low frequency visceral impact and weight. The dethroning of my longtime steed. Over the last seven years the Aerial 7Bs have served me well as my main reference loudspeakers. With the CPRs in my rig it was like I dove off of a diving board with a big cannonball splash, landing in the deep end of that preverbal reference loudspeaker swimming pool. Don't get me wrong the Aerial 7Bs are great speakers, but they are clearly NOT a reference speaker of the caliber the CPRs exemplify. 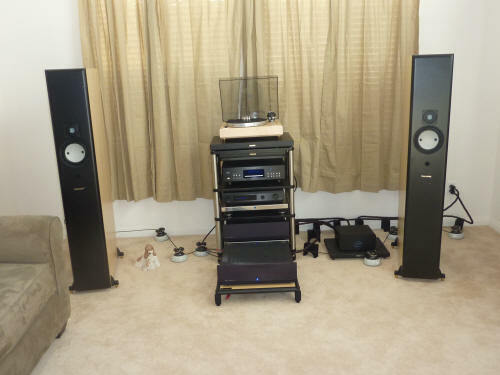 Over the years I have owned a lot of different loudspeakers from varying manufacturers (in order of ownership) starting with Advent, Genesis, A/D/S, Kef, Tannoy, Vandersteen, Meadowlark, JM Labs, and finally Aerial, yet none of these bowled me over like the CPRs. Up until the CPRs landed in my rig it was the Aerials that seemed to be the speakers for me. At 400 hours of break in time the CPRs gelled together from top to bottom so well that I clearly could not tell when the music at crossover point was being handed off from subwoofer to woofer/midrange to tweeter. Driver integration at that point in time was so spectacular, you could almost swear you were listening to a stand mounted two-way speaker, if it were not for the visceral bass and large sense of scale and weight of music being presented to the listener that only a large speaker can truly communicate. Another thing I noticed while listening to the CPRs was the clear difference in voicing between the amplifiers I was using. Though this attribute was noticeable prior to the CPRs in my rig, now with them in line, I could hear the voicing of each amplifier with stunning clarity showcasing their individual differences between the trio of amplifiers I had on hand. All three of the amplifiers had a clear and distinct sonic signature, thus making it even easier to decide which sounded the best driving the CPRs. As with its reputation, the E.A.R.-Yoshino 890 was most clean sounding, being detailed, extended from top to bottom, and taking full advantage of its Class A KT-90 output tubes. The Anthem Amp-1SE+ was warm and inviting, with a romantic and succulent midrange due to its EL-34 based sonic signature. Finally, the Cary Audio Xciter sounded good, but was too far to the left of the romantic end of the spectrum for my personal enjoyment. For most of my listening, well below 90dB peaks, the Anthem Amp-1SE+ is inviting and truly easy on the ears. I especially like listening to the Amp-1SE+ with the CPRs for small group jazz and acoustic type music. For music that was more dynamically challenging, like rock and classical music, the 890 was the better choice as compared to the other two amplifiers, due to its added headroom when driving the 94dB CPRs. For music that is clearly well recorded the 890 was the way to go. The 890 was always closer to the musical truth than the other two amplifiers I had on hand, thus it was the amplifier I used for most of this review. Couple the 890 with the CPRs and the system had a purity of timbre that in my opinion has no peer. It was that good! Regarding proper power to drive the CPRs, all three amplifiers had enough power to drive them to well over 80-95dB peaks in my room, with the 890 being able to drive the CPRS to clearly concert level decibels at 100dB+. Even at low listening levels around 65-75dB, the CPRs still did not disappoint, the soundstage was deep and wide, with enough detail and inner harmonic clarity to please any audiophile. However, it was when you stepped on the gas at 90-100dB+ peaks that CPRs really come alive. When most speakers at 100dB+ peaks are beginning to break up, the CPRs are just beginning to purr like a well tuned Jag. It is that ability to play loud without audible cone break up that is one of the CPRs greatest virtues as a true reference loudspeaker. The CPRs will work fine with as little as 5-watts and up. After all of the listening I have done for this project, I had come to the conclusion the CPRs were my hands down favorite for any speaker priced under $35,000, and beating many others above that price point. Overall, what I gained from this 16 week adventure was the final realization that the CPRs are really good speakers. Almost any loudspeaker, after taking a closer look at them, you can usually find a fault. Having the CPRs in my listening room for the last four months and logging well over 150 hours of personal time with them, try as I might, I could not fault them at all! If I were to split hairs the only issue would be driving the CPRs in a small room, there I could see with the 94dB efficiency coupled with two large 12" woofers per side being a bit too much. But, without actually trying it, and bearing in mind the flexibility of setting the woofers inside or outside to custom load them to match your room, perhaps in a small room the CPRs would work. One thing that is for sure, in my current room, the CPRs were among the most neutral, revealing, and clearly enjoyable loudspeakers I have ever heard. The CPRs clearly bring out the best of each performance, no matter what genre of music is thrown at them, be it classical, opera, heart pounding new wave, distorted punk, old school classic rock, or intimate and closely mic'd bebop jazz. Each and every time the CPRs came out on top. Twenty two thousand dollars is not chump change when considering a reference loudspeaker. For many audiophiles the CPRs may be beyond their financial reach. Still the CPRs represent an excellent value for those who can afford them. The CPRs are easy to drive and sound great with almost any amplifier from a low of 5-watts to well over 100 watts. Could you run the CPRS with more wattage? Yes, sure you could. But why would you want to? In my opinion, find the best amplifier you can afford (preferably tubes—sorry tube amplifiers are my sonic preference) and "forget about it." Never have I heard a speaker before play music with such skill and dexterity, demonstrating the best of PRaT, clarity, precision, and musical aplomb as I did with the CPRs. The CPRs are of true heirloom quality, and for those who can afford them, more than likely be one of the last if not the last speakers you will ever own! The CPRs are not only groundbreaking in their performance regarding dollar per dollar ratio, they may reset your thinking as to what a true reference speaker should be all about. I know it did mine, thus, I give the CPRs my highest recommendation. After not having a pair of the Coincident Pure Reference loudspeakers in my rig for the last 2 months, I couldn't take it any more. I am now moving forward to buy a pair. More on that later.... There is no doubt these will be my last pair loudspeakers I will ever own, or so my wife hopes. One thing that is for sure--there has never been a loudspeaker that has moved me emotionally like the CPRs. They are truly THAT good. My suggestion rush out and buy a pair before Israel realizes he is giving them away at their current retail price—also don't forget that Canadian Dollar is getting stronger and stronger against the U.S. Dollar. I would like to extend my appreciation to Jeff for a remarkable review. He expertly captured and articulated what makes the Pure Reference so special and a singular achievement in loudspeakers. To create a state of the art loudspeaker that is constructed to the highest standards, utilizing the world's finest components, that is aesthetically beautiful to behold AND can be driven by any amplifier from the lowest powered SETs to behemoth tube and solid state units, AND sounds superb in small (as little as 13' x 10') or large environments AND retails for $22,000 is the result of years of R&D and thousands of hours of intensive labor. When I designed the CPR and its newer CPRE, they were meant to be an all out assault on the state of the art without cost restraints. No expense or detail was spared in the quest to create the world's finest speakers. The fact that both the Pure Reference and the Pure Reference Extreme, while not inexpensive, are offered at real world and breakthrough prices is mainly due to military like efficiency in production, very low overhead costs and very tight profit margins. Indeed, the lowest mark ups in the industry. It is especially gratifying when all the effort and expertise that went into developing the CPR and CPRE is recognized and appreciated by knowledgeable audiophiles, music lovers and professional reviewers. We are thrilled at Coincident that our components have been responsible for enhancing the enjoyment of the musical experience.